The fortunes of the European beef sector this year rely heavily on the developments within the European and global dairy sectors. According to the French market analysts France AgriMer, the removal of milk quotas in April last year and the fact that the beef sector relies heavily on dairy cows will have a significant influence on beef production and prices. Over the last year the price of milk across the EU fell by 17.5 per cent to €65 per 1000 litres, with particular effect on the main dairy producers. Because of the abolition of milk quotas, the 2015 survey of the number of dairy cows showed a 3.7 per cent increase in the UK, 3.5 per cent increase in the Netherlands, 5.7 per cent rise in Ireland and even a 0.8 per cent increase in Romania. The dairy herd, however fell in Spain, Germany, France and Poland. While the dairy herd across the whole of the EU rose, the suckler herd was stable with the EU 15, the main producers seeing a drop of just 0,1 per cent and the entire EU 28 seeing a rise of 0.6 per cent. The main growth in the suckler herd has been in Belgium and France with a small rise of just 0.4 per cent in the UK. However, between 2014 and 2015, cow slaughter rose across the EU by 3.4 per cent with significant numbers in Italy and France. 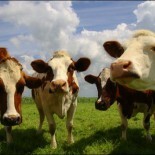 There was also a sharp rise in heifer slaughter numbers of 5.5 per cent across the EU. The slaughter of male cattle aged between one and two years fell across the EU by 0.5 per cent, although generally across the whole of the EU there was a rise of .7 per cent in all young cattle. The report from France AgriMer shows that the EU is developing the market in third countries for lea cattle, which is starting to help to push cattle slaughtering up. While the trade with the EU for European beef has been rising – up by two per cent in 2014 – and last year saw a rise of 3.1 per cent in wholesale slaughter cattle, exports of European beef fell by about one per cent. With consumption rising in the EU, Europe found itself self-sufficient in beef and veal last year. Consumption is up by more than two per cent to 15 kg per person per year. It is forecast that the increase in production will continue, with a further rise in the slaughter of cows and young cattle and the UK, Ireland, Spain, Germany and France being the countries most affected. France AgriMer said that the meat trade in the EU will rely on dairy animals for two thirds of its supply in the coming year and the dynamics of the dairy market including whether prices recover on the world market will have a strong influence on the progress of the beef sector. Imports are expected to rise slightly despite the high availability of domestic beef within the EU, particularly in the UK and Germany. The EU dairy herd reached 23.6 million by the end of 2014 as the herd grew to meet market hopes and expectations offered by the end of quotas. Before quotas were removed, 12 countries, Luxembourg, Poland, Austria, Ireland, Netherlands, Germany, Cyprus, Belgium, Denmark, Estonia, Italy and Spain all increased milk production above their quota limits. However, the removal of the quota restraints were met by the start of the difficult global trading situation and trade imbalance, with demand falling and production rising. However, this did not stop some countries continuing on the path of increasing production. In the first eight months of 2015/16 Ireland increased production by 15.9 per cent. The Netherland saw a rise on production of 9.1 per cent, \Belgium 10.2 per cent, Denmark 4.1 per cent and the UK 3.1 per cent. Germany saw stable production 8in the first eight months of the 2015/16 year and France saw a limited increase of just one per cent. France AgriMer said that the drop in prices did not stop rises in production, even as global prices fell. Prices fell on average from €80 per 1000 litres to €65. France AgriMer added that demand slowed as production rose because of the Russian ban that affected most producing countries except New Zealand and the sharp reduction of imports to China, including milk powders. The increase in production, was seen on a global scale with Australia’s collection up by 3.8 per cent in the first 10 months of the year and New Zealand also showing growth between April and July last year. Global prices for all products – butter, powders and whey – were down last year, but despite the competition, the EU producers managed to find some good markets around the world because of the favourable exchange rates between the Euro and the US and New Zealand dollars. Middle Eastern countries and South East Asia increased their imports of both skimmed and whole milk powders, as EU prices dropped for all products. Prices for whole and skimmed milk powders also dropped in Oceania and in the US over the year reflecting the general malaise of the sector. This entry was posted on April 6, 2016 by agedchrisharris in Cattle, Meat, Uncategorized and tagged Beef, cattle, Dairy, EU, Markets, meat, milk, trade.